This post is Part 3 of 3 about Metareal’s collision subsystem. In Part 1 and Part 2, we described how boxes can fly through spaces, hit each other, push each other, and stop when they hit walls. In this final Part we’ll look at a few glossed-over details… And then the rather glamorous feature which allows several boxes to be treated together as a composite volume. But that’s not important. In the Meteral world, we need to know where things are. We consider each “thing” as a box-shape (or a collection of box shapes). This is described as a position (X,Y,Z), and a radius in each axis (Rx, Ry, Rz). To detect collisions, both for physical movement and also for game triggers, we need to ask: “Which boxes, if any, are we touching?” One way would be to check every single box in the world. Even for Metareal’s modest universe of about ten thousand anticipated objects, this would be quite slow. Time is framerate and all that. There are a number of well-known techniques for optimizing this (K-dimensional trees & oct trees are two of them) but I chose a simple one: fixed-size bins. Since objects in Metareal are all in a bounded area about 1200 units across, and somewhat evenly distributed, this works well. Each bin is 16 units across. Why 16? Trial and error, and most objects are less than 16 units big. To check for a collision, we just look in the bin where our collider is (its center point), as well as the 26 bins adjacent to it. Ah, you say, But what about objects that are bigger than 16 units? Well… I put them in all the bins that they’d hit. It’s a little bit inelegant for large objects, but seems to work. When an object moves, we see if its center has changed bins. If so, we remove it from all the bins it was in (usually just 1, but more for a big object) and add it to all the bins it will be in. Again, somewhat dorky for large objects, but it works for now. Many bins are empty. To locate a bin, we index into a std::map<long, Bin> with a 48 bit hash derived from 16 bits each for X, Y, and Z bin-position. 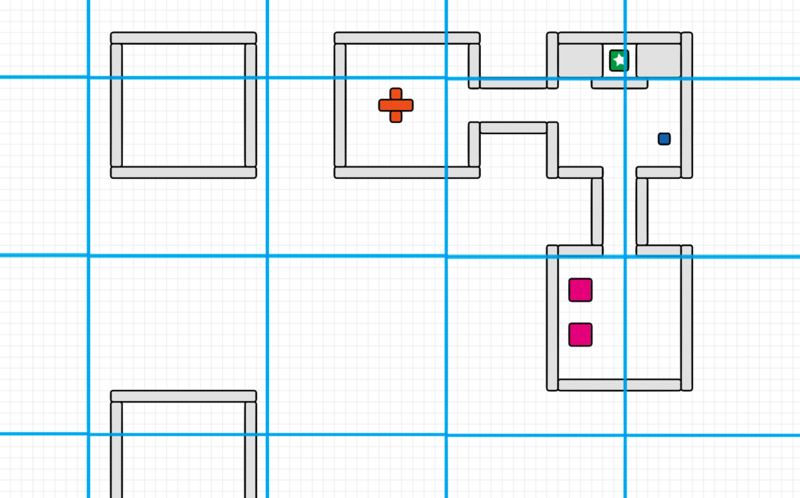 (With a 1200 unit world and 16 unit bins, could fit into 8 bits per axis and an int map index… but it’s fine.) The way std::map works, bins pop into existence the first time it is accessed. 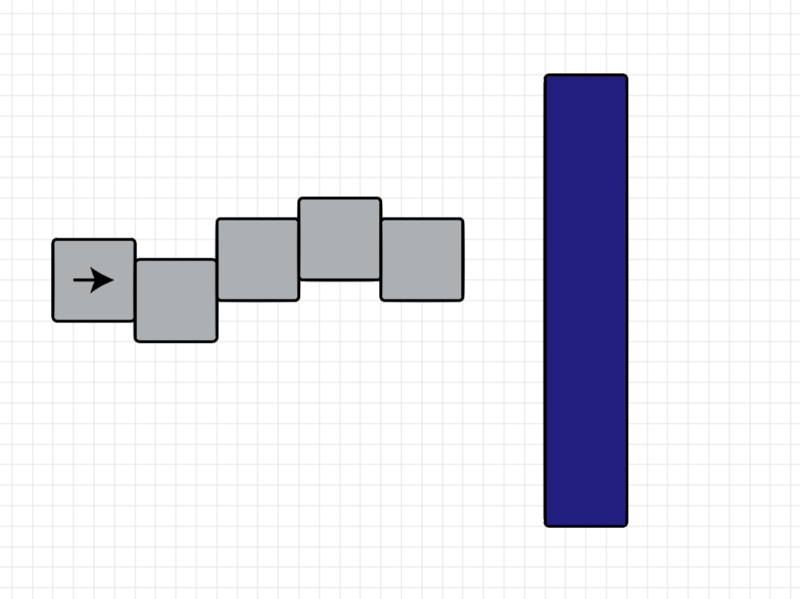 In Part 2, we described how collisions know when to stop: When the thing moving or something it’s pushing hits a wall. This feature is actually very slightly deeper. Every object has an Inertia value, which represents how hard it is to push. And every movement has a Force value, which is how big an object it can push. If the Force is bigger than the Inertia, then the thing can be pushed. Else, it is stopped. In a chain of several objects moving, the original Force is transferred through all the pushed things. I’ve found you can get quite far with a world whose only colliders are box-shaped. Especially in this game, where the physics are inherently… boxey! 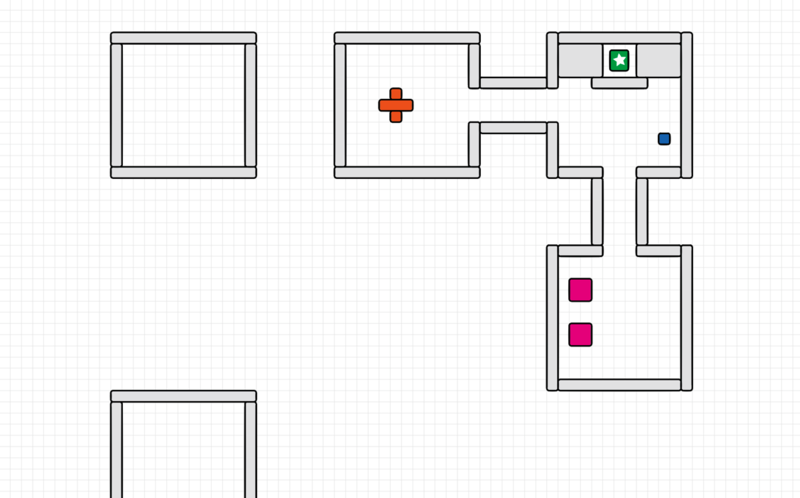 Still, it’s valuable to have other shapes, for certain kinds of puzzles where you push or manipulate pieces with corners or fitting areas and such. The implementation builds the technique described in Part 2, and is almost disappointingly simple. 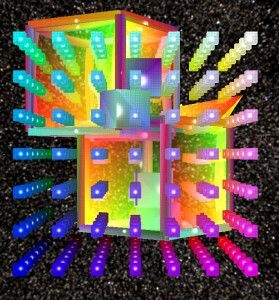 To move a compound collider, move each of its component boxes as a single box, and the resulting possible movement is whichever of them can move the least. When it pushes other objects, they each check how for their components can move. Illustrated above is a simple volume pushing a compound volume. Shown below is the movement of several linked compound objects. It alternates between the game-render view, and a debug view showing the component volumes. Now, because I sometimes let my code evolve a bit too long before refactoring, the actual data structure is that each CollisionVolume object includes a std::vector of all its fused CollisionVolumes. And they all point to each other. Which is maybe an odd way to do it and slightly wasteful of space, but it works and that is that for now! And now, a few notes about the Metareal Engine architecture. As mentioned earlier, of course it’s silly to write my own, let’s move on. The library presently consists of two major components: Rendering and Volume Management. The Rendering side deals with lists of triangles, groupings of parts, geometry lists, and shader graphs. The Volume Management side deals with detecting intersections of volumes, and notifying listeners. Physics is built on top of volume management, as a special case of responding to intersections. In this post, I’ll talk about one aspect of Rendering. The class MeRenderWorld is presently the highest level container. An application may use several, certainly, but this is the top container on the library side. The MeRenderWorld itself knows nothing about OpenGL; rather it deals with MeIMaterials and MeIPartRenderers and MeITextures and so on. For now there are only two implementations of each, one for OpenGL and one for FakeFL, which just records actions suitable for unit testing the library. Often, one wants to describe a process by means of a document, perhaps in XML or similar. Describing the graph of draws and post-processing for a final scene frame is a perfect example of this. However, I have a strict policy of implementing code first, document second. Here I’ll show the code mechanism for building up a render graph. Here we see that each frame will be created with three actions: a clear-to-color, and two material draws. Today this is, in fact, exactly two glDraw() calls, but that could change. The empty strings are the names of frame buffers. The unnamed buffer, “”, is the default output buffer. This might be the screen or window, or be another buffer, depending later on the argument to rw->draw(). In this sequence, the background is cleared and then drawn with a skybox. Then, the opaque parts of the geometry are drawn onto a buffer named “b0”. This buffer is created on-demand by MeRenderWorld, you just have to name it, and it exists. That first render is provided as a texture argument to the transparent material, in a uniform named “texture1”, which is then drawn onto “b0” also. Lastly, “b0” is copied to the output. (addCopyingStep() is a macro which instantiates a screen-sized rectangle textured with one buffer, drawing to the other). And there’s a peek into the Metareal Engine’s rendering component.